I was saddened to hear of the death of Sylvia Woods on Thursday, the owner of Sylvia's in Harlem and a native of Hemingway, S.C.
Back in 2001, when I was doing a series of profiles on important people in Carolinas food, I spent an afternoon at Sylvia's writing this story about Mrs. Woods and her journey. It's an experience I'll always remember: I had made the appointment and arrived a little early to eat lunch. But Mrs. Woods' husband was ill and she had to take him to a doctor. I ended up waiting 3 hours, sitting so long that I felt like I'd end up unpacking my suitcase and spending the night in that chair. When she finally dashed in, around 4 in the afternoon, it was worth the wait. I was charmed by her warmth and earnestness, and all the practicality that was built into her life story of getting from a small farm to owner of a popular New York restaurant. How can you not love a woman who calls you girl and pats your hand when she's only known you for a few minutes? Here's the story I wrote out of that afternoon. AT SYLVIA'S RESTAURANTS, YOU'RE ALWAYS A HEARTBEAT FROM HEMINGWAY, S.C.
NEW YORK - On the map, it looks like a long way from Hemingway, S.C., to Harlem. But Sylvia Woods didn't leave Hemingway all that far behind. Her restaurants - the world-famous Sylvia's on Lenox Avenue in Harlem, one in Atlanta and a third in the works for Kennedy Airport - serve the same soul food she learned to cook back on her mother's farm. Her cookbooks, "Sylvia's Soul Food" (Morrow, 1992) and "Sylvia's Family Soul Food Cookbook, " (Morrow, 1999), are laced with family stories and pictures. And a line of canned greens, beans and hot sauces has her face beaming from supermarket shelves all over the country. No, to Woods, Hemingway is not far away at all. She follows the same rules she learned on the farm: Keep busy. Put family first, but treat everybody like family. Save your money, but give the credit to a higher power. Woods is 75, a tiny woman with big glasses, big hair and a big smile. But her eyes are young and so earnest she looks like a girl disguised as a great-grandmother. Herbert Woods, her husband of 56 years, is in poor health these days. Getting him through a doctor's appointment, then riding in from their home in Mount Vernon has made her hours late for an interview. But the restaurant has provided a constant show. From noon until well after 3 p.m., the three dining rooms are packed. Fifteen Japanese businessmen are being introduced to collards at one long table while a German-speaking couple is being fed at the next. The walls are crammed with testimonials and signed pictures. Madeleine Albright, Bill Clinton and a plaster silhouette of Dr. Martin Luther King Jr. share space with the Shady Grove Youth Singers of Gaffney, S.C. A proclamation from the S.C. governor's office is next to a signed poster from Spike Lee's “Jungle Fever,” which included a scene at Sylvia's. At one table, a young man is showing his date the menu. By now, the trip between Hemingway and Harlem is family tradition. Woods goes back twice a year, “religiously, Labor Day and Christmas,” with children, grandchildren and great-grandchildren. But her mother made the trip from Hemingway to Harlem first, following the path of so many blacks who left the South during the Depression. Woods' father died two weeks after she was born. Sylvia's mother left her with her grandmother and went to New York to work as a laundress, wearing a money pouch under her clothes. When she had five $1 bills, she changed them into a $5. Two $5s became a $10. Five $10s became a $50. Bigger bills were harder to spend. Saving that way, Woods’ mother sent money home until she could afford to come back to the farm. When Woods went north, she saved the same way. Woods met Herbert in a bean patch, when she was 11 and he was 14. She knew they were meant to be together, and they weren't meant for farming. So after Herbert's tour in the Navy, they married and headed to New York. They got an apartment in Harlem and had four children - Van, Kenneth, Bedelia and Crizette. Herbert drove a cab and Sylvia got a factory job on Long Island. She didn't like it much. It was a long commute, and the carfare was expensive. A few blocks from the apartment was a small place, Johnson's Luncheonette. Woods' cousin worked there but was leaving. She convinced Woods to ask for her job. "I was scared to death, " she says. "We couldn't afford to eat out. I knew how to set a table at home, but I had the fear - how did I know how to do it in a restaurant?" But she figured it would save carfare, and she could eat free. So she took the job, then set out to be a great waitress. In 1962, the owner approached Woods about buying him out, for $20,000. “I was so shocked. I laughed, I thought he was kidding.” She told him she didn't have that kind of money. “He said, ‘Yeah, but your mama's got a farm.’ I said, ‘No way.’ If I didn't make it, my mother would lose her land.” But she told her mother about the offer. Her mother decided to mortgage the farm for $10,000. “Girl, I planned that thing out to a T.” As a waitress, she made about $22 a week, plus tips. Herbert had his pay from the cab. She figured out that she could make the payments and have enough left over to buy a crate of greens and five chickens. Fried chicken and greens would be the menu, along with smothered beef liver, neck bones and pork chops. The menu didn't change, but the neighborhood did. Woods had bought into Harlem when most people wouldn't have given a nickel for it. “This block was infested with drugs. Girl, I was terrified.” She kept a baseball bat under the counter and when toughs would come in, she'd send her husband and sons to the kitchen and handle it herself. When the riots started, her business was spared. But a Jewish-owned paint store on the corner was burned. Woods leased that space and then a bar next door. She expanded several times, eventually buying the building. In 1981, New York magazine's influential critic, Gael Greene, came in. 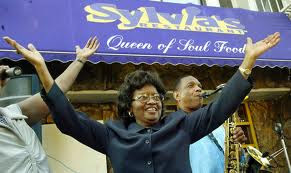 She raved, dubbing Woods “Queen of Soul Food.” People flocked to Sylvia's. About that same time, Harlem changed again. European and Asian tourists discovered it, riding in tour buses past the nearby Apollo Theater. Woods was approached by tour guides. “I thought, who's coming to Harlem - this raggedy place?” She agreed to try it, but couldn't figure out how to serve such big groups quickly. “A dream came to me - family. Serve ‘em like family.” The restaurant set up a special deal for tour groups. Three meats, three sides, brought to the table in bowls, family-style. The tour groups are still coming, especially for the Sunday jazz brunches. The restaurant was originally closed on Sunday, to give the family time together. But once, when Woods was behind on the electric bill, she opened on a Sunday to make extra money. It was so profitable, she kept doing it. Today, the Sylvia's restaurants employ all four Woods children, even a number of her grandchildren. The packaged foods are run by Woods’ son Van. The canned versions of the family's collards and limas are a little sweeter than the restaurant versions, but that's how Woods likes them. She still comes in every day, but these days, she lets her children run the show. “Look,” she says, “I'm 75. I'm getting wearied a little. We loved the eggy macaroni and cheese at Sylvia's, where it is served as a side dish. The recipe is in "Sylvia's Soul Food" (Morrow, 1992). Preheat oven to 375 degrees. Cook macaroni in a large pot of salted boiling water until tender but not mushy, about 8 minutes. Drain well and pour into a large mixing bowl. Stir in butter, 11/4 cups milk, eggs, 13/4 cups grated cheese, salt, pepper, sugar and food coloring (if using). Mix well and transfer to a 1 1/2-quart oval baking dish. Pour the remaining 1/4 cup milk over top and sprinkle with remaining 1/4 cup cheese. Although the menu at Sylvia's now offers things like grilled salmon, the old dishes are still the staples. This recipe, from "Sylvia's Soul Food, " calls for shoulder chops, but we tested it with pork loin chops. You could also halve the meat and vegetables, but keep the gravy ingredients the same. Trim excess fat from the edges of the pork chops. Sprinkle each with some of the 1 teaspoon salt and pepper. Season 2 cups flour with the remaining 1 tablespoon salt and pepper. Dredge chops in the flour until coated on all sides, shaking off excess flour. Pour the vegetable oil in a deep, heavy skillet, such as cast iron, over medium-high heat. When the oil begins to shake slightly, add as many pork chops as will fit without crowding. Fry, turning once, until well-browned on both sides, about 5 minutes. Remove chops to a plate and repeat with remaining chops. Pour off all but 1/4 cup drippings from the skillet. Reduce the heat to medium and add onions, green peppers and celery. Cook until brown and soft, about 10 minutes. Sprinkle 2 tablespoons flour over the vegetables and bottom of the skillet. Cook, stirring, until flour is golden brown. Slowly pour in 2 cups water. Stir, then cook until thickened. Soul food wouldn't be the same without collards. This version, from "Sylvia's Family Soul Food Cookbook" (Morrow, 1999), trims some fat by using smoked turkey wings. In a 4-quart saucepan, bring the water and smoked turkey to a boil over high heat. Reduce heat, cover and simmer for 1 hour. While the turkey is cooking, wipe the collards and wash well in 2 or 3 changes of water to remove all grit. Cut away the thick stems and discard. Chop greens into 1/2-inch pieces, to make about 10 cups. Add collards, oil, salt, pepper, sugar and pepper flakes to saucepan. Increase heat to high and bring to a boil, then reduce heat, cover and simmer for about 30 minutes. Discard turkey if desired, or remove skin and bones, chop meat and add to the collards. From "Sylvia's Family Soul Food Cookbook." Like the corn bread served at the restaurant, this version is tall and cakey, thanks to the eggs. Preheat oven to 350 degrees. Grease a 9-by-13-inch baking pan. In a large bowl with an electric mixer, beat the milk, oil and eggs. Add the cornmeal mixture and stir until just combined. (Batter will be wet and a little lumpy.) Pour into prepared pan and bake for 40 to 45 minutes, or until a toothpick inserted in the center comes out clean and the corn bread is pulling away at the edges. Cool in the pan, then cut into 15 squares. Thanks, Brant. I enjoyed getting to know her. Wow. Those 4 recipes are definitely keepers. My mouth is watering just reading them. Kathleen, thank you for sharing this story again. We are often reminded that " the simple things" are truly the most satisfying. Last evening, I prepared the most simple of summertime meals that included collard greens, a wonderfully ripened cantaloupe melon, fresh tomatoes and, of course, warm cornbread. This story reminded me of how thankful I am for that meal and for the people like Sylvia who taught us how to prepare and enjoy delicious food served up with a generous portion of warm hospitality. What a wonderful story. I grew up in New York City but have lived in the Carolinas for 25 years. I love the family aspect of her story and a women business owner is always an inspiration. I've been a vegetarian since the 70's and have never tasted pork, fish or seafood so alot of the recipes mentioned are completely foreign to me. But I have family that farmed back in the day and come from a long line of women who were good cooks.